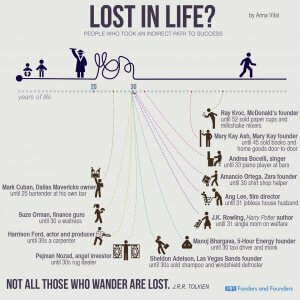 Home ElitePosts Think You’re Too Old to Be An Entrepreneur? Think Again. If Hollywood wants to portray an entrepreneur in a movie, then he — and it’s usually a he – is in his early 20s, may or may not have a college degree, is probably wearing blue jeans and a hoodie, and is a bit unkempt, with messy hair and facial hair. Ray Kroc, the founder of McDonald’s, sold paper cups and milkshake mixers until he was 52, according to an info-graphic from San Francisco-based startup organization Funders and Founders (below). Meanwhile, the founder of cosmetic behemoth Mary Kay, Mary Kay Ash, sold books and home decor objects until she was 45.